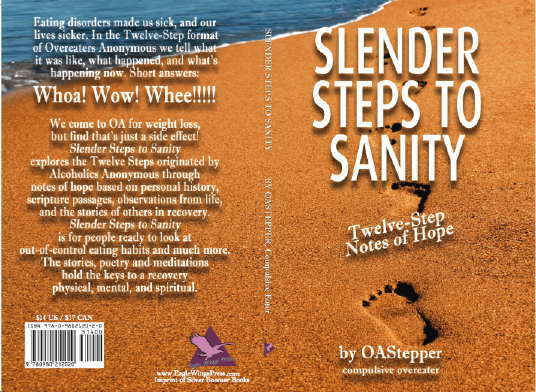 Click here to order your copy of Slender Steps to Sanity for $14 plus shipping costs and, in Texas, sales tax. OAStepper is a contributing author to the Recovery Daily Dose blog. Eating disorders made us sick, and our lives sicker. In the Twelve-Step format of Overeaters Anonymous we tell what it was like, what happened, and what's happening now. Short answers: Whoa! Wow! Whee!!!!! We come to OA for weight loss, but find that's just a side effect! 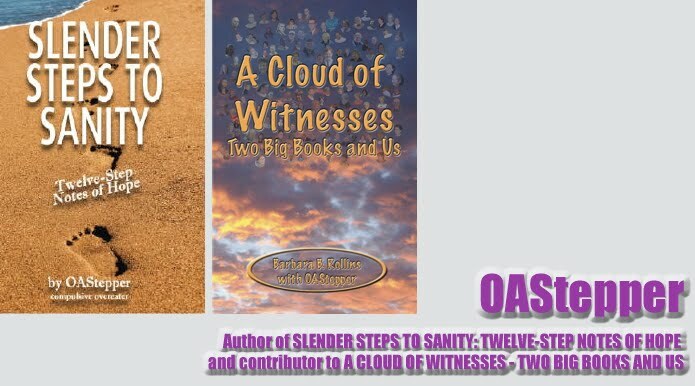 Slender Steps to Sanity explores the Twelve Steps originated by Alcoholics Anonymous through notes of hope based on personal history, scripture passages, observations from life, and the stories of others in recovery. Slender Steps to Sanity is for people ready to look at out-of-control eating habits and much more. The stories, poetry and meditations hold the keys to a recovery physical, mental, and spiritual. Recovery's inherently personal path paradoxically requires company; the Twelve Steps can't be walked alone. Come with me. Nobody speaks for Overeaters Anonymous. I certainly don't. I've not been in these rooms long enough to do anything but sit back and learn. Yet as I've blogged, including drafts of these notes of hope, you've been kind enough to encourage my sharing them. I'm honored to offer them, hoping they may do for you what other OA members have done for me – sharing recovery, inspiring leapfrog realizations. If anything I say doesn't ring true for you, find your own truth. I learn as much from those with whom I disagree as from those whose words I wish I'd said. I have tried to remain true to the message of the Big Book, Alcoholics Anonymous. I would suggest if you find I have not, seeking your own consistent truth certainly is the better course. Recovery requires company. Find an Overeaters Anonymous group through the website, www.oa.org, or join an online group like www.TheRecoveryGroup.org. Find a sponsor, and read OA approved literature. I welcome your comments and an opportunity to visit with you. My blog is www.oastepper.blogspot.com. My email address is oastepper@gmail.com. I wish you peace, serenity, recovery, and joy.